The term “Cult” gets used and abused quite a bit. Actually Wikipedia has a nice article on the term “Cult” and its many different usages. Starting from the perspective of orthodox/historical Christianity, I would like to look at the word in terms of “Good”, “Bad”, and “Ugly” and then take a more “functionalist” look at the term “cultic”. 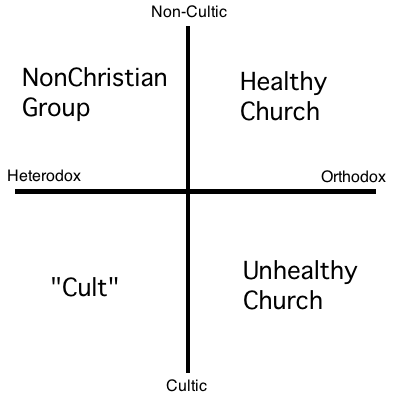 In the diagram above, the quadrants are based on whether a religious group is Orthodox or Heterodox (from a historical Christian perspective, that is) and whether it behaves in a “cultic” or “non-cultic” manner. So what does cultic mean? Many Christians describe anything that “isn’t Christian” as being a cult. That becomes difficult in practice. Others often use “cult” to refer to “small unpopular religions.” This is also difficult in practice. Most all religions, good or bad start out small and unpopular. I think that a lot of us have a certain thing in mind when we use the term cult or cultic. We are talking about groups that are heavily authoritarian, abusive, and tear down the individuality or selfhood of the individual. Authoritarian: Unconditional obedience to the leadership. Averse to Criticism: The person who dissents is a problem to fix– not the issue brought up. Image Conscious: Protecting the reputation of the leaders or church is more important than truth or justice. Perfectionistic: Individual worth is determined by performance. No compassion for weakness/failure. Unbalanced: Group distinguishes itself by overemphasizing a minor theological point. With this in mind, religious groups can be divided into the class four quardrants. The term “cult” traditionally meant a group of people who came together for worship. In some languages, cult (or cultos) does not have a negative connotation. So if a group is Orthodox (good theology) and not behaviiorally “cultic,” one could view this as a Good Cult, or a Healthy Church. So for some people the term “cult” may be used here, but doesn’t identify something bad, but rather something good. I would like to suggest that the term “cult” can refer to groups that would ultimately be BAD. Many Christians refer to any group that is not orthodox as being a cult. This may not be useful. But it is reasonable to separate between groups with sound Christian theology and those that do not. Heterodox groups could be described as being “Bad” cults. With this definition, however, some may have cultic traits as I have listed above, and some may not. Not all non-Christian religions (or heterodox religions with Christian roots) are cultic. Some others are cultic in their behavior/operation. Ultimately, both of these are “bad,” from an Orthodox Christian perspective The groups that are heterodox and cultic, are often what much of the broader population calls “cults” today. Ultimately, from a Christian perspective any group that has teaching that nullify or distort the Gospel (even if they are not behaviorally “cultic” could be described as bad. I would like to argue that cults at there worst are cultic in their behavior and orthodox in there essential theology. Why is that? Orthodox Christian groups that behave in a cultic manner make Christians look bad. Christians (nominal or otherwise) do enough to make Christians… Christianity… Christ look bad. Orthodox Christian groups that have cultic (authoritarian, abusive) behavior are somewhat mutant… we don’t know what to do with them. It is like Muslims with Jihadists— should they condemn them, accept them, or something else? What do we do with groups that embrace essential Christian truths but don’t act or function in a Christlike manner? We need to be part of a Healthy church and promote such…. even if they are not our specific style. We are right to oppose (lovingly, respectuflly, gently, and dialogically that is) falsehood, so we need to oppose Bad “cults”… other faiths… be they cultic in behavior or not. Our biggest challenge will be what to do with groups that a Christian doctrinally, but cultic behaviorally… cognitively Christian while not being Christlike. These are the ones that will be truly challenging. That is Why They are The Ugly. Why Do Good? Or Why Not?